Is there anyone in this world who doesn’t like a good cookie now and again? Show me that person and I’ll show you someone who’s having no fun in life. I on the other hand, could happily eat cookies everyday of my life – they’re on of my worst Achilles’ heels: if cookies are in the nearby vicinity and they’re good, I’ll find them. 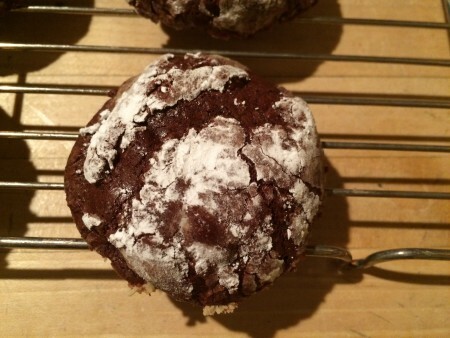 So today, I’m sharing one of my new favorite recipes for dark chocolate gluten-free cookies. These cookies were first created over the Christmas holidays, but after whipping up the first batch, I knew they’d be making a repeat appearance: they’re that good. Not to mention they’re gluten-free and low-fat, which is just extra icing on the proverbial cake and reason to eat a few extras at less than 100 calories a pop. How much better can it be? 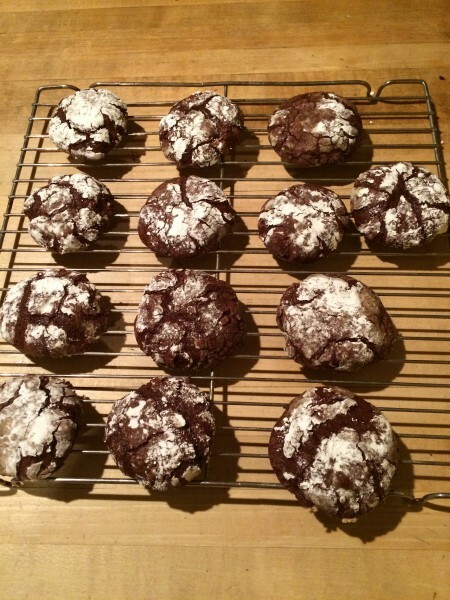 So without further ado, I give you my dark chocolate gluten-free cookies! Melt 1 cup of chocolate chips in a glass bowl in the microwave, stirring twice, about 3 minutes. Set aside to cool slightly. Using a handheld (or stand) electric mixer, beat the egg whites in a large bowl until they form soft peaks. Gradually beat in the sugar, and continue beating until the mixture looks like marshmallow fluff. In a separate, small bowl, whisk together cocoa, cornstarch and salt. Then, on lower speed, beat the dry ingredients into the meringue. Stir in the lukewarm chocolate last and the 1/4 c. of remaining chocolate chips. The dough will be very thick and stiff at this point. Here, I put the dough into the freezer for 3 minutes to let it firm up a bit before attempting to work it into balls with my hands. Place 1/2 c. of powdered sugar in a shallow bowl, roll 1 rounded tablespoon of dough into a ball, and roll that in the sugar, coating thickly. Place the ball on a cookie sheet covered in parchment paper and press down slightly to flatten out. Repeat this process with the remaining dough, spacing each cookie 1.5 – 2 inches apart on the cookie sheets (you’ll probably need two sheets). Bake until the cookies puff and crack, about 10 – 12 minutes. Remove them from the oven and let them sit on the sheets to cool for 10 minutes before gently transferring to the rack to cool completely. Store in an airtight container for up to 10 days (they won’t last that long, though). Doesn’t that just make you drool? Look at all that cookie goodness. This entry was posted in Desserts, Recipes and tagged Chocolate, Chocolate Cookies, Cookies, Dark Chocolate, Dark Chocolate Cookies, Dark Chocolate Gluten Free Cookies, Desserts, Gluten Free, Gluten Free Chocolate Cookies, Gluten Free Cookies, Recipes on January 14, 2015 by Paige N..